When you've got a foot of freshly fallen snow to absorb any impact, there's no sledding stunt that seems too dangerous. 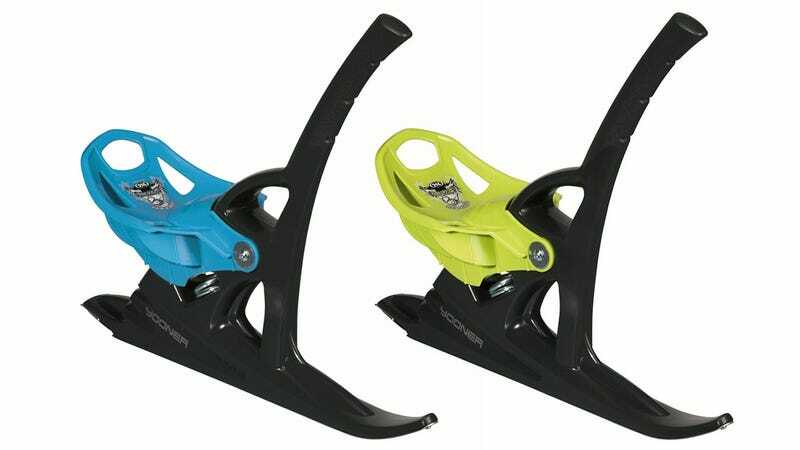 It's only when you're careening down a hill towards a jump that the gravity of the situation hits you, and that's when you realize a sled with a built-in shock absorbing spring like the Yooner is a wonderful idea. Designed and built in France, the Yooner is less like a sled and more like a single ski with a built-in seat and handle, which makes sledding a bit like driving a Vespa scooter down the side of a snow-covered mountain. Or, in other words, way more fun that you can have with a plastic disc. The Yooner's heavy-duty shock absorbing spring will have any rider—amateurs and daredevils alike—purposely aiming for the steepest jumps. And if things get too out of control the sled's even got a built-in brake activated by pulling on the handle and leaning back.